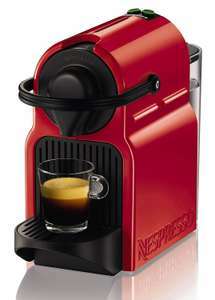 At home I grind fresh beans and use a traditional espresso machine, but I find nespresso type pods pretty useful for a quick, clean and easy solution at work (although not very environmentally friendly). I've been using a Wacaco Minipresso in the office which I'd originally bought for camping/travelling, and fancy getting a proper machine that can sit somewhere discretely and not make too much noise or mess. I find the Aldi ristretto pods pretty nice and they're only about £1.80 for 10. How you finding it? Amazon reviews have really put me off. Doesn't sound like it looks the part either. Now there's a belief that Brexiteers famously don't do facts, but before we jump to that conclusion, is there a chance you have confused KRUPS with KRUPP? Anyone know if Chelmsford store have any?? Fantastic little machine. I have one at home and one at work, both work perfectly reach and everytime. Highly recommended. &#x1F525;I recently bought this for £69 and one of the best purchase's I've made. I regularly go to the gym and helps me get my quick caffeine fix in the mornings. A complete waste of money buying this machine as the coffee strength is dictated by the pods. Putting more water through a pod designed to make an espresso will just give you a crap tasting coffee. 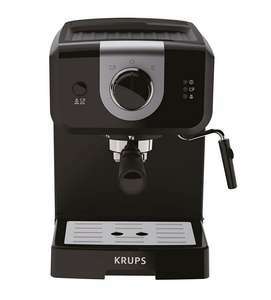 I got a very similar one to this from Amazon.de after a deal was posted here after having two delonghi machines with reliability issues. 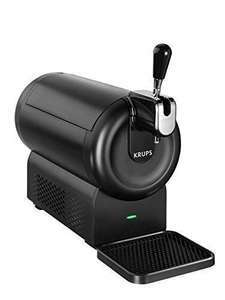 I am happy with the quality of the coffee from the krups, but it appears to use a Lot more coffee beans to produce a similar size and strength to all my previous bean to cup machines. 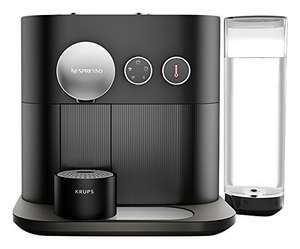 We've had our Krups bean to cup, very similar to this but black, for 4 months and not had an instant coffee since. We get very good results with grinder set to finest and strength at Max. Son has a Delongi and thinks ours gives a better coffee. We all like strong coffee. Admitted the steam wand needs cleaning after every use , isn't that the case with all steam wands? If you think one of these machines produces coffee like instant, then stick with it. Same with any decent Champagne, if Lambrini is your taste, why spend more. Takes up more kichen space than an upmarket instant coffee and far more expensive!!! Thank you - with the current offer plus this made it a great present plus beer for dad sorted! Have to buy £45s worth at a shade under £9 each as it currently stands on Amazon. That's quite a mark up. Also the fact that the Subs website - the main supplier - is sold out of half the beers doesn't fill me with confidence that these will even be around long term in the UK.